The 2015 J-POP SUMMIT will begin with an Opening Night Premiere Screening event on Friday August 7th at The Castro Theatre, and also take place Saturday and Sunday August 8th and 9th at the historic Fort Mason Center in San Francisco’s Marina district. Additional details are available at: www.J-POP.com. The 2015 J-POP SUMMIT also announces its first two Guests of Honor – pop singer Eir Aoi and the all-girl rock band Gacharic Spin. Both artists will perform live for fans and attendees on the Fort Mason Center main stage. ONE DAY J-POP SUMMIT PASS: FORT MASON: Includes One-Day access to J-POP SUMMIT at Fort Mason Center either onSaturday, 8/8 or Sunday, 8/9. WEEKEND J-POP SUMMIT PASS: FORT MASON: Includes full Two-Day access to J-POP SUMMIT at Fort Mason Center on bothSaturday, 8/8 andSunday, 8/9. KIDS WEEKEND PASS: FORT MASON: Includes Full Two-day access to J-POP SUMMIT at Fort Mason Center on both Saturday, 8/8and Sunday, 8/9. Ages 6-12: $15.00 Ages 0-5: FREE *No One-day Pass for kids. V.I.P. J-POP SUMMIT PASS: FORT MASON: Includes Full Two-day access to J-POP SUMMIT at Fort Mason Center on both onSaturday, 8/8 andSunday, 8/9. J-POP SUMMIT V.I.P Passes include: A ticket to the Opening Special Premiere Event at The Castro Theatre on Friday, 8/7; a Weekend Pass to Fort Mason Center for Saturday, 8/8 & Sunday 8/9; Access to Priority Line to the film screenings at the Japan Film Festival of San Francisco at NEW PEOPLE Cinema from Sat. 8/8 to Sun. 8/16 (NOTE: Film tickets are NOT included, sold separately); Access to Priority Line to SAKE SUMMIT at UNION SQUARE on Sat. 8/8 and Sun. 8/9. (NOTE: Admission to SAKE SUMMIT is NOT included, sold separately); Access to VIP Check-In at The Castro Theatre and Fort Mason Center; Access to premium viewing areas at the Fort Mason Center Stage; Exclusive J-POP SUMMIT Gift Bag. The 2015 J-POP SUMMIT is proud to announce pop singer Eir Aoi and the all-girl rock band Gacharic Spin as its first two featured performers and official Guests of Honor. Both artists’ appearances are made possible with the support of PROMIC (Foundation for Promotion of Music Industry and Culture) and RAIJ (Recording Industry Association of Japan). Pop singer Eir Aoi is widely known for performing the theme songs to a variety of popular anime series including Fate/Zero, Sword Art Online and Kill la Kill. She has released 3 full albums since her debut in 2012. In Japan, Eir Aoi is signed to SME Records (Sony Music Entertainment). Additional artist information is available at: http://www.j-pop.com/eir-aoi. The 2015 J-POP SUMMIT also welcomes Gacharic Spin, one of the strongest, most aggressive, most flamboyant, all-female bands from Japan.Gacharic Spin has performed in the U.S., Korea, China, Hong Kong, France and Luxemburg and will make their first-ever San Francisco appearance at the 2015 J-POP SUMMIT. 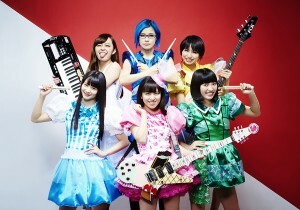 Additional information on Gacharic Spin is available at: http://www.j-pop.com/gacharic-spin.